An exceedingly pretty space at one of London's most famous addresses. 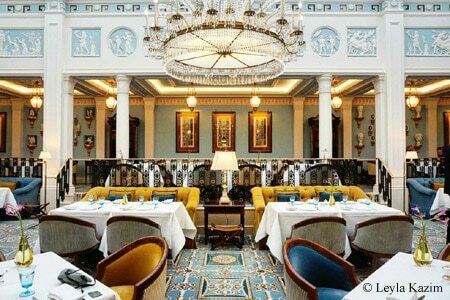 : Where Apsleys once stood in The Lanesborough, you’ll now find Céleste, an exceedingly pretty space decorated with fluted columns, powder-blue walls, English crystal chandeliers and 250 bas-relief moldings framing the glass-domed roof. Commandeering the kitchen under the guidance of esteemed Parisian chef patron Eric Frechon is executive chef Florian Favario, formerly head chef at Epicure in Paris. Don’t miss the posh scotch egg, a Burford Brown with a golden runny yolk, wrapped in a layer of chicken mince and rosemary-spiked lardo from Colonnata, with earthy truffle mayonnaise. The plate of tagliatelle-style vegetable ribbons, despite the generous chunks of lobster, was bland and uninspiring. Much superior was the Norfolk black chicken, confit crispy leg and girolles mushrooms. The very essence of these birds reduced to a concentrated and intensely satisfying plate of food. To close, go for commendable desserts in the form of a glossy and seductive chocolate mousse with streusel crumble, and an eton mess made vibrant with mango. The Lanesborough is often referred to as ‘the most expensive hotel in London’ but the menu price point tells a different story, with an accessible set three-course lunch at £44, £48 for a traditional afternoon tea, and £55 / £95 for a 5-course / 7-course dinner menu. Bottles of wines start at £25 with a few offerings around £30, before rising quickly to prestige territory.